"James Joyce and the Jesuits: a sort of homecoming", Bruce Bradley, The Word, June 2004. The chapter "George Dempsey" in Portraits: Belvedere College, Dublin, 1832-1982, John Bowman and Ronan O'Donoghue, 1982. "Allude to me as a Jesuit: James Joyce and his Educators", Bruce Bradley, New Perspectives on James Joyce, 20th Conference of the James Joyce Spanish Society, 2009, pp.243-262. bapt 1854 [St.Mary's RC par records]. He taught English and History at Belvedere College 1884 to 1923. At marriage he was living 2 Fitzgibbon St, off Mountjoy Square (near Belvedere College). He mar 1888 to Mary Doyle [born 20 March 1865]. Despite teaching at Belvedere College on the northside, he also ran a grocery and post office on the southside, at 13 Dunville Ave, Rathmines (near Ranelagh, see map). He is George S. Dempsey, grocer, post office, 13 Dunville Ave, Rathmines, listed in [Thom's] at least 1894 to 1919. He was James Joyce's English teacher at Belvedere 1894-98, and was an important influence on him. He picked him out early as a talented writer and encouraged him. He would set an essay title for the other students, and then he would say: "And Joyce, you can write about whatever you like." In 1899 he put Joyce in contact with the editor of The Fortnightly Review, who then published Joyce's first published work in 1900. See entry on Dunville Ave, Rathmines, in [Census, 1901]. He is listed as "Professor, Belvedere College". In 1907 George Dempsey got a poem of Joyce (now in exile) published anonymously in The Belvederian [Bradley, 2004]. Belvedere of course wanted nothing to do with Joyce until attitudes changed in the late 20th century. See entry on Dunville Ave, Rathmines, in [Census, 1911]. He is "Professor of English Literature". They have two servants living with them. He was also the English teacher of the poet Austin Clarke (born 1896) who was at Belvedere in 1905-12. 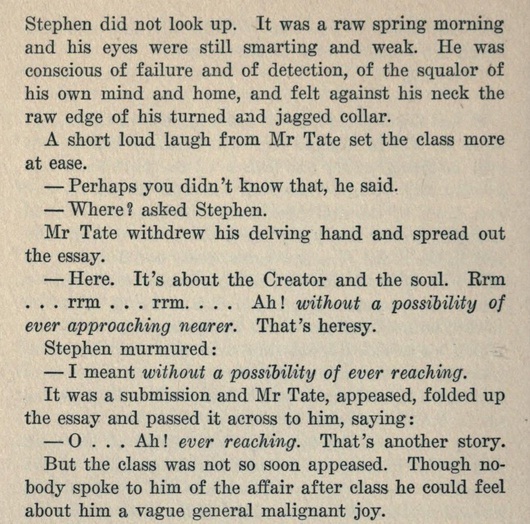 The character of "Mr. Tate" in Joyce's novels A Portrait of the Artist as a Young Man (1916) and Stephen Hero (written 1904-06, published 1944) is based on Dempsey. George died 29 June 1924, 13 Dunville Ave, age 70 yrs. See death notice in Irish Times, June 30, 1924. He was bur at Glasnevin Cemetery, Tuesday, July 1, 1924. See funeral list in Irish Times, July 3, 1924. See obituary in Irish Times, July 5, 1924. 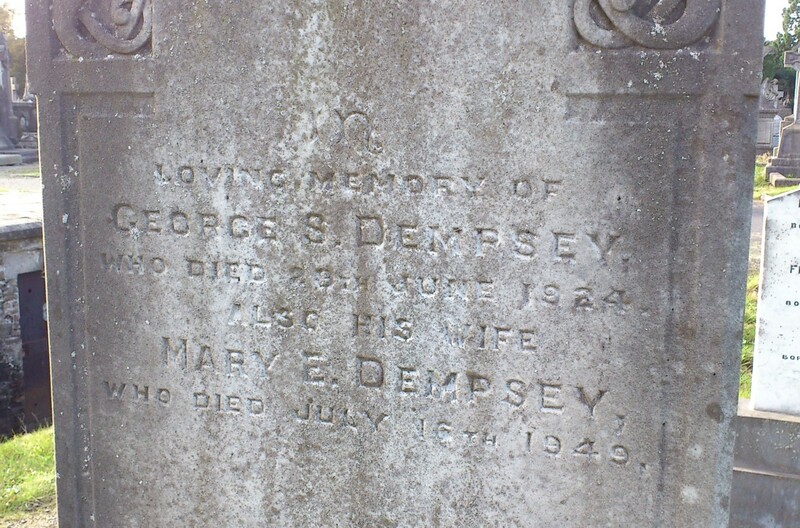 "Mrs. Dempsey" is listed as niece of the Alderman at his death 1931. [Grave record] says her address at death was Garda Depot, Phoenix Park (with her daughter). She died 16 July 1949, age 84 yrs. She was bur with husband at Glasnevin Cemetery. (todo) See death of Mary Ellen Dempsey, [GROI], 3rd qr 1949, age 84, Dublin South, vol 2 p 367. 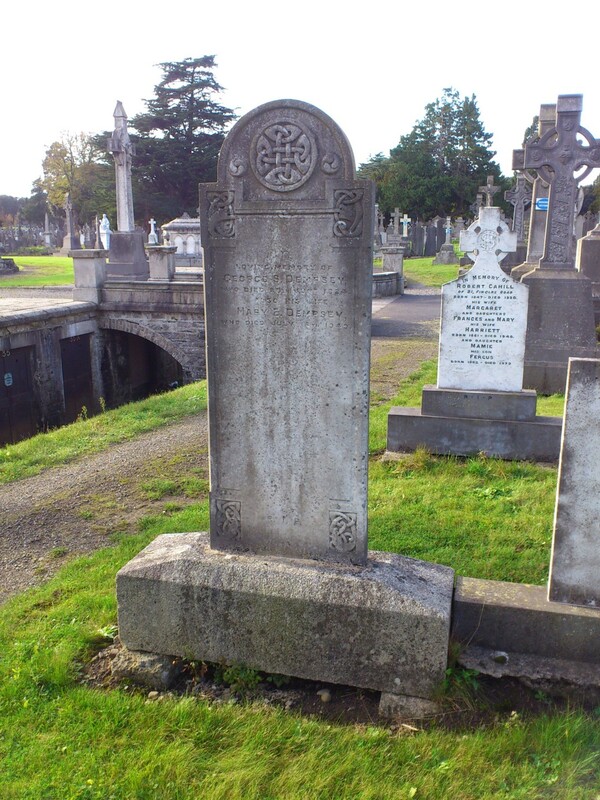 (todo) see marriage of John Patrick Healy and Eileen Dempsey,	[GROI], Dublin South, 1st qr 1916, vol	2, p	656.
died 28 Oct 1897, age 5 yrs, bur Dempsey grave at Glasnevin. (todo) see marriage of Vincent Ellis and Marjorie Dempsey,	[GROI], Dublin South, 1st qr 1921, vol	2, p	639. (todo) see mar of Edward Thomas McElligott and Geraldine Dempsey, [GROI], Dublin South, 3rd qr 1922, vol 2 p 464. Mr. Tate in Ch.2 of A Portrait of the Artist as a Young Man. 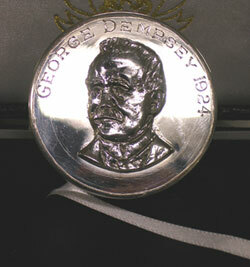 The George Dempsey Memorial Prize. Grave of George Dempsey, Glasnevin Cemetery, Dublin. Location: Letter: GF, Figures: 205, Section: GARDEN. Far side of the O'Connell Circle. Photo 2013. See full size and wider shot. 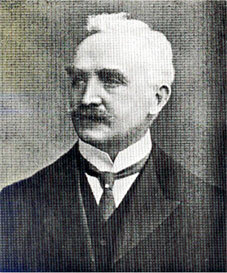 The Belvedere Union Prize (established 1906), an annual prize for English writing at Belvedere College, was re-named The George Dempsey Memorial Prize in 1925 in memory of Dempsey. It is still awarded annually. Winners of the George Dempsey Memorial Prize include Owen Dudley Edwards and John Bowman and Adrian Hardiman. In each year at Belvedere there are separate classes or houses. There used to be a "Dempsey (D)" class each year, after George Dempsey. Mr. Tate does not appear in the drama A Portrait of the Artist as a Young Man (1977).